It would be a voyage to remember; whether it ended happily or whether it didn’t. One thing was for sure — it wasn’t going to be a picnic for Captain Gustav Schroeder. The Nazi regime had a way of working its way into everyday life. And now here, on the MS St. Louis, Schroeder knew that the Nazis had penetrated shipboard life. As the Jewish passengers filed aboard Schroeder had a few run-ins with the Gestapo, a photographer from the Ministry of Propaganda, firemen who were Gestapo and a Nazi agent posing as a steward, Otto Schiendick. The captain would treat the Jews as equals and would brook no nonsense from anyone on his ship who would do otherwise. Schroeder’s attitude, for the most part, reflected in the attitude of his crew. They too were putting their best foot forward. The crew made every possible effort to accommodate the refugees. When shoddy supplies were called for to stock the ship, Schroeder left it to his able purser to do the opposite, which the latter was successful at. For the passengers the respect they received made it seem as if they had stepped into another world. On shore they had been second-class citizens deemed unworthy of respect. 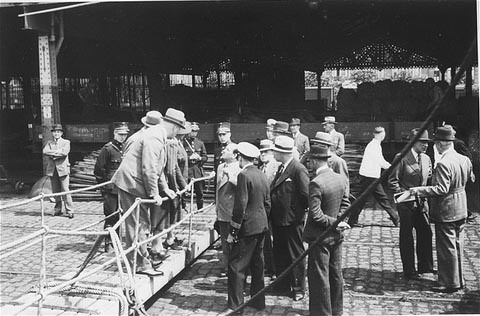 Days before the St. Louis was to set sail for Cuba Jews began arriving in Hamburg from different areas of Germany in anticipation of the trip. For them it was not always a matter of wanting to leave. It was a matter of life or death. A few had been released from concentration camps and given a set amount of days to get out of the country. Others were fleeing observation of suspicious Nazis. Ultimately each of these individuals knew they were destined for concentrations camps and were getting out while the getting was good. 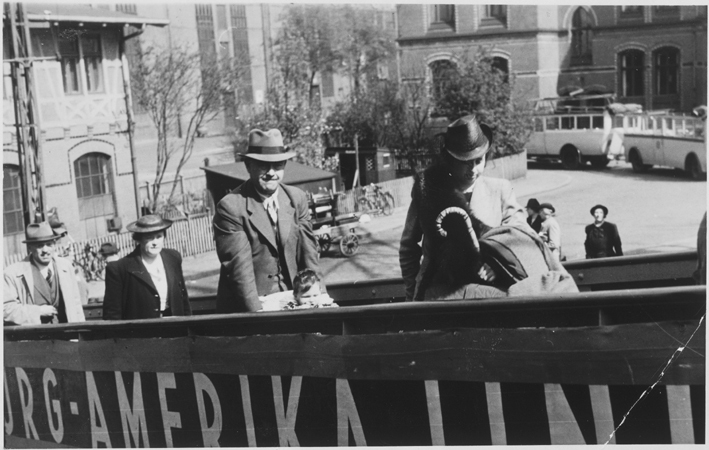 The departure of the Jews from Germany to Cuba served a double purpose. Operation Sunshine would allow for important documents concerning the United States to be smuggled out of Cuba and to Germany. The other purpose was propaganda. Antisemitism had been stirred up in Cuba and the prospects of the Jews being allowed into the country was somewhat shaky. The Hamburg-America Line which owned the St. Louis would not inform Schroeder until the last minute. If the 937 Jewish passengers were not allowed into Cuba then it would only “prove” what Nazis had been saying; why accept the Jews in their own country when other nations of the world wanted nothing to do with them? Once it was too late to do anything about it Schroeder was radioed some unfortunate news; two other ships carrying refugees were headed for Cuba, as well. If they arrived before the St. Louis, Schroeder’s passengers may be turned away. And so it was a race against the clock. Schroeder’s was, naturally, angry over this. The company seemed to be keeping him in the dark purposefully. In his words, they were “using” him. And he didn’t like it one bit. The company could have his resignation when the trip was over if that’s the way they wanted to play. On 13 May 1939 the St. Louis set sail. She would pick up more passengers in Cherbourg to make for a complement of 937 before proceeding to Cuba. As the vessel steadily plied the Atlantic waters, the president of Cuba was making plans to turn the passengers away. On board the passengers were enjoying the crossing. There were those who had endured so much in Germany that they had become overly paranoid or withdrawn. Passenger Recha Weiler lost her ailing husband on May 23. It had pained the elderly man to have to leave Germany. Recha was left to mourn his loss. With a rabbi and the help of the crew, the deceased man was buried at sea. Schiendick had the audacity to recommend a Nazi flag be draped over Weiler’s body. Needless to say he was ignored. Not long after the burial a crewman committed suicide by throwing himself overboard. A search was carried out and a boat launched but with no results. It wasn’t until very early morning that the search was called off. In anticipation of the problems that lay ahead in Cuba, Schroeder selected a man to head up a passenger’s committee which would be concerned with the refugees disembarkation; the prospects of which were getting dimmer and dimmer by the day. Schroeder informed them that he would not stand by and allow them to return to Germany. The captain would do all in his power to aid them. On May 27 the St. Louis arrived in Havana. It was the end of a long journey and passengers were anxious to meet the relatives who waited for them ashore. But it soon became painfully clear they were not going ashore that day. As time dragged on it didn’t looks as if they would go ashore any day. Negotiations were ongoing, but the terms were extraordinarily expensive or unfeasible. The St. Louis was finally ordered out of Cuba as discussions carried on. In the end when the president finally granted them permission to come ashore he revoked it just as the St. Louis was sailing back for Cuba. It was a frustrating situation. For the passengers it was a death sentence. The United States would not take them. Cuba would not take them. There had been offers from other South American countries but they had been deemed impracticable. The condition of passengers’ emotions were so bad that a suicide patrol had been formed. It wasn’t without grounds. There had been several suicides. One incident in Cuba had resulted with a paranoid passenger slashing his wrists and then jumping overboard, fearing the Gestapo was out to get him. He had been taken ashore after a crewman saved him. In fact, he had been left behind in Cuba while his wife and children were still on the ship. A few passengers had been allowed off the ship in Cuba and now there were only 907 refugees left. In a last ditch effort, as the ship was recalled to Hamburg, Schroeder and his officers made plans to set the ship afire off the English coast where passengers would be able to make it to shore. As it turns out Schroeder would not have to result to such drastic actions. An agreement had been met. Belgium, England, France and Holland would take the passengers. The over 900 passengers were “distributed” among the countries with Britain taking the most. The long journey came to an end on June 21 when the last of the passengers arrived in Southampton. It was indeed a journey to remember and one that had not quite ended. Source: Thomas, Gordon and Max Morgan-Witts. Voyage of the Damned. In many ways, it’s a journey that will never end. True, Jill! Their memory continues on. I like reading things that happened long ago, I guess you could say I’m a history liker. not a buff, but a liker, because I don’t know a lot, yet! Me too. History is filled with so much interesting events and people. It’s almost endless! If only everyone, especially the politicians, need to know this stuff! Then they would not do such stupid crap!!!!!! There’s a saying that goes something along the lines of “those that forget history are doomed to repeat it”. It’s a scary thought. I reblogged it on my blog about 403 Squadron. Ground crew were at Bergen-Belsen and the son of one of them wrote me to tell me about it. This is the link. Glad you liked it enough to reblog it. I’ll stop by to read the posts you linked. Enjoyed the reading the post. I also like history but certainly not a buff but enjoy learning more. As do I. There’s always room in our minds to learn more! Thank you for posting this extremely interesting piece of history. I had no idea. And thanks to Britain, Belgium, France and Holland, it did not end badly. Thank you for sharing. Well almost. When Germany invaded some of those countries an unknown amount of the St. Louis refugees died. 😦 I left it out, but even those nations were nitpicking the passengers deciding which ones they would have and which ones they would turn away. But yes at least they had the heart to take them when no one else would. For that they are to be commended. Oops! I was so busy goofing off I for got to say thank you! You’re welcome! If everything is to be believed then I have immense respect for Schroeder and his crew. They were indeed putting their lives on the line to do the right thing; their respect of their passengers went a long way. And he had to tolerate so much of Schiendick’s ridiculous antics aboard the ship (that would be a post in itself!). I’ll give it some thought. It really is interesting. At times I couldn’t help comparing Schroeder to a babysitter and Schiendick as a spoiled brat, albeit a very evil spoiled brat. Researching and reading material for this post was depressing. The refugees went through so much. You could almost feel their despair when they found out they would be returning to Germany. Thank you for writing on important topics few of us know about. How very upsetting for all involved. We continue to debate the morality, responsibilities, and repercussions of immigration. For those emigrating, it is simply an act of desperation. If circumstances were different, few would leave their homeland. Immigration is a big step – in this case it was somewhat forced. I can only imagine what was going through the minds of the refugees. They were leaving their homes, friends and family, everything they’ve ever known. And if that isn’t bad enough the officials practically robbed the poor people! Who was this Schroeder? I mean, I did read the link you posted, but how did he become the man he was, I wonder. I also wonder about the descendents of those 900 + people. Your posts always leave me with so many questions and I say that in the most complementary way!! Thank you! That’s a thought provoker! Someone should write his biography. I too am curious about what or who it was that helped to mold his character. Schroeder was obviously a man of very strong principles. I’ll bet the descendants would have stories to tell! They could probably be traced given all the various genealogy databases available anymore. I might have been willing to give it a go if I didn’t have other projects at the moment. So glad you enjoy the posts, thanks so much for reading them! Great post and great bit of history as usual, JG: thank you! You’re welcome, Stefano, glad you liked it! Oh, it’s just so terrible the things people do to each other. I felt so deeply the despair of those fleeing refugees… thanks J.G. for telling the story. It’s wonderful to know that there were some who hadn’t lost their “moral compass”. Few and far between as they may have been it’s inspiring to hear stories about such people. In Gordon Thomas’ book there were before pictures showing happy passengers sailing for Cuba. Then there were the after pictures that show the most dejected looking people as the St. Louis sails back to Germany. It illustrates just how bad things were. Really interesting post. I know that another ship off Jewish refugees was turned away from everywhere, including the United States, and there was nowhere to go but back to Germany, where they were all murdered by the Nazis. Heartbreaking and shameful. I’m glad these people had a happier ending. It was a terrible time for so many people. I first heard of the M/S St Louis in the children’s novel “The Other Half of Life”. Heartbreaking. After reading this I understand more about my grandfather, and even more so the make up of my father. I am even more proud of my Schroeder heritage now and I didn’t think that could be possible. My husband had such admiration for my father he gave our son the name Schroeder for his middle name. Very good of you to share all of this information. So glad you found the post of interest. I have the utmost respect for Captain Schroeder. There is much more which is not covered in this post and I highly recommend “Voyage of the Damned”. There is a good deal of information about Schroeder in that book; what all he went through on the voyage, butting heads with the Gestapo aboard, and an epilogue if a recall correctly.